While construction in Jewish settlements of the West Bank and neighborhoods of Jerusalem has long been carried out within the frame of the law and in accordance with proper licenses issued by the relevant authorities, the Palestinian construction is illegal in every respect. The Palestinian goal is to create irreversible facts on the ground. The sheer enormity of the project raises the question: Who has been funding these massive cities-within-cities? And why? There is good reason to believe that the PLO and some Arabs and Muslims, and especially the European Union, are behind the Palestinian initiative. The Jewish outpost of Amona, home to 42 families, is currently the subject of fiery controversy both in Israel and in the international arena. Apparently, settlements are only a "major obstacle to peace" when they are constructed by Jews. The EU and some Islamic governments and organizations are paying for the construction of illegal Palestinian settlements, while demanding that Israel halt building new homes for Jewish families in Jerusalem neighborhoods or existing settlements in the West Bank. The hypocrisy and raw malice of the EU and the rest of the international community toward the issue of Israeli settlements is blindingly transparent. Yet we are also witnessing the hypocrisy of many in the Western mainstream media, who see with their own eyes the Palestinian settlements rising on every side of Jerusalem, but choose to report only about Jewish building. 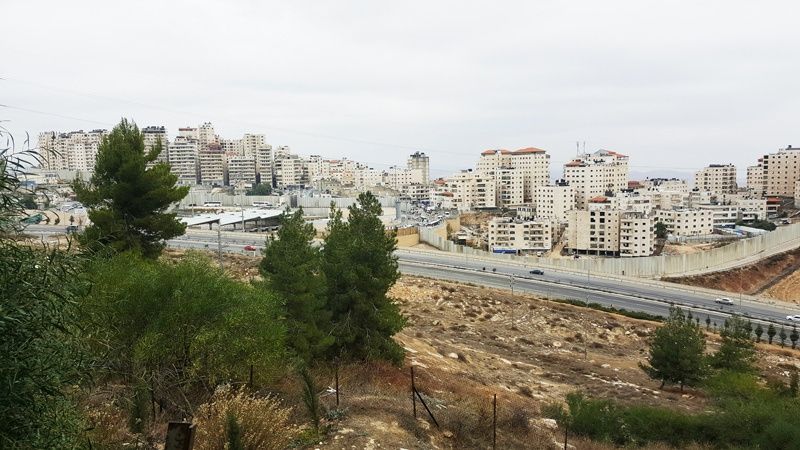 In Area C, a stretch of land accounting for 60% of the West Bank, the European Union, which bitterly condemns construction in Jewish settlements as illegal, openly funds illegal construction carried out by Palestinians. The EU argues that its support for Palestinian construction falls under the category of "humanitarian relief" and is permissible under international law. I think it is wonderful that the EU etc. has built 'us' these beautiful homes. Now, we expel those who moved into them against the law, and move in Jewish families, such as those expelled from Jewish communities in the Gaza District and northern Samaria. If the apartments are empty, then the Jerusalem municipality should force them to be used to rehouse Jews. Doesn't the municipality of Jerusalem have planning laws, permissions that must be granted before building can be enacted, and without which buildings may be legally demolished? Have you forwarded this crucially important article to the Wall St Journal and the Washington Post, the only 2 US media who might actually publish it ? Maybe also the NY Observer ? Also to FLAME, whose list I have apparently fallen off of, so do not know if they have already spoken about this. While the Jews are one of the smallest minority groups in the world and do nothing but contribute to world knowledge and wish for peace, Islam is the largest (or maybe second after China?) ethnic/religious group in the world and contribute nothing but sheer ignorance and the wish to destroy civilization as the rest of the world knows it. Where is the political correctness for the Jews? Is it jealousy of our achievements which prompts the hatred? Thank you. In the USA if you build something illegally without permits and proper engineering, it will be demolished. Israel has to stop supplying water & power to these areas. The sewage treatment plants alone cannot handle the extra load it puts on them. World opinion be damned. Tear them down! Israel loses if it rips out the illegal construction because then it will be reported that big bad Israel is putting Palestinians out of their homes (even if the apartments are empty) and it loses if it does nothing and permits all the illegal building. It makes me so angry when I read throughout history of the crushing intolerance directed at the Jews. It is insane and it is not right. They are a fine and intelligent people who have made disproportionate and great contributions to humanity. They have been faithful to their religion. What? For thousands of years under the most trying of conditions! Their very existence is an incredible message for those willing to hear and with the intelligence to understand. I am a retired professor getting up in years, and as a Mormon I have great respect and a spiritual affinity for these fine people. I only regret that I am not back on campus laying into some of the anti-Semitic types face-to-face. As a nation it's time for us to show, decisively, as a nation who we are standing with!!! STOP this coward's political correctness stand. Is not Israel the only democracy in the Middle East. Indeed it is the only country that does not terrorise its neighbours. Happily it is the only country capable of winning wars. Its history in the region dates back 3000 years. As time passes by, the EU countries will be mired up to their eyeballs in fighting for the lives of their nations and citizens against refugees who are really not that friendly and very costly to keep indefinitely. Europe has experienced just the tip of the iceberg when it comes to economic refugees and those escaping the same Islamism they are bringing with them to Europe. Settlements are always viewed one-sidedly – the world only concerns itself when Israel builds homes on its own land Jews hold by their historical rights and permanent status in the region ... and reaffirmed in modern times the British Mandate, the UN, the League of Nations and many treaties. If we do not respect historical treaties then we will have to unravel the entire fabric of modern states throughout the world and begin to redraw the global map. I suggest that the Arabs save their money and start building "settlements" in places other than Israel because you will need them to house the millions you have displaced these past 6 years in your quest for a bloody Islamic Caliphate. Perhaps Europe will come to its senses and shut its doors with force – and so you will need other options. And while Europe is forced to begin to mind its own affairs, then I would suggest Israel annex those nice illegal settlements recently built by "Palestinians" and their helpers at great cost to the Islamic world and the leftists who chip in from every direction (churches, unions, NGOs, the UN, Pro-terror foundations, etc. ).